How I Traveled With Texsens Cat Backpack: Does It Worth $150? If you love your cats as much as I do, then you also probably love taking them around with you wherever you go. The problem is, cats – unlike dogs, can’t really be tied to a leash and be made to walk or follow us around.They are not built like that psychologically and cats are not really hardwired to be pack followers, they would wander around or just choose to stay and lie in one place. That’s why I decided to buy Texsens cat backpack and I want to share my experience. I work a lot, and what happens is when I come home late at night, I would only get to spend about an hour or two with my pets before I go to sleep. In the morning, my partner and I get up early to either jog or do a quick bike route in the park, and that’s what we also do in the weekends. We live a very active life, we go to the gym, try to go on short trips a lot on the weekends, run, and bike and swim together. 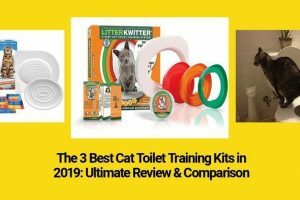 Because of this almost exact weekly routine, I feel guilty sometimes because I don’t get to bring my cats or other my pets along with us or spend as much time as I would like with my furry family. Introducing the Texsens cat backpack. I first saw Texsens Bubble Backpack Pet Carriers on Instagram while following pictures of cute cats and dogs. It looked fresh, hip and cute, but I did not think that that it would be the answer that I was looking for. I thought the Texsens Bubble Backpack Pet Carriers was just another fad or novelty pet item that would outgrow its time. Then I saw a pink one and I thought about my only lady cat Flora because I thought it would really suit her, then I started looking for it on the internet and voila. Now, don’t be confused, there are a lot of other bubble carriers out there, but in my experience, the best bang for your buck bubble backpack would be Texsens Bubble Backpack Pet Carriers. Read on if you want to know why. 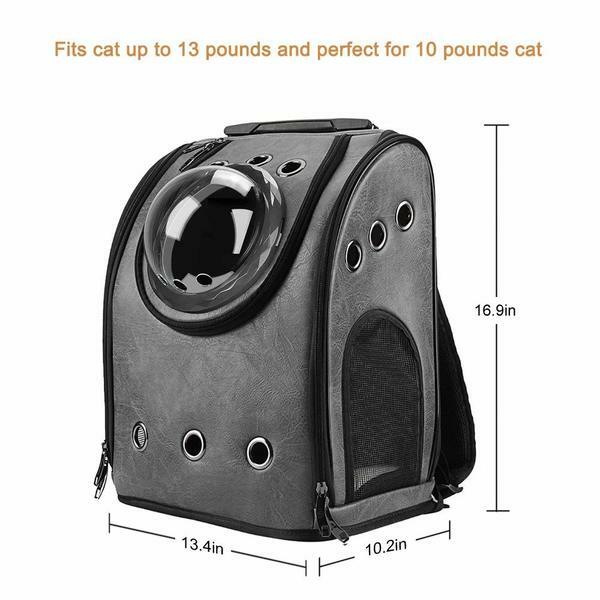 Texsens cat backpack measures 16.9 inches high, 13.4 inches in length and features a 10.2 inches wide width space for your cats inside. It comes in light at a mere 4.1 pounds and is sturdy enough to carry an 8 pound to an 13-pound heavy ball of cute and cuddly cat goodness. 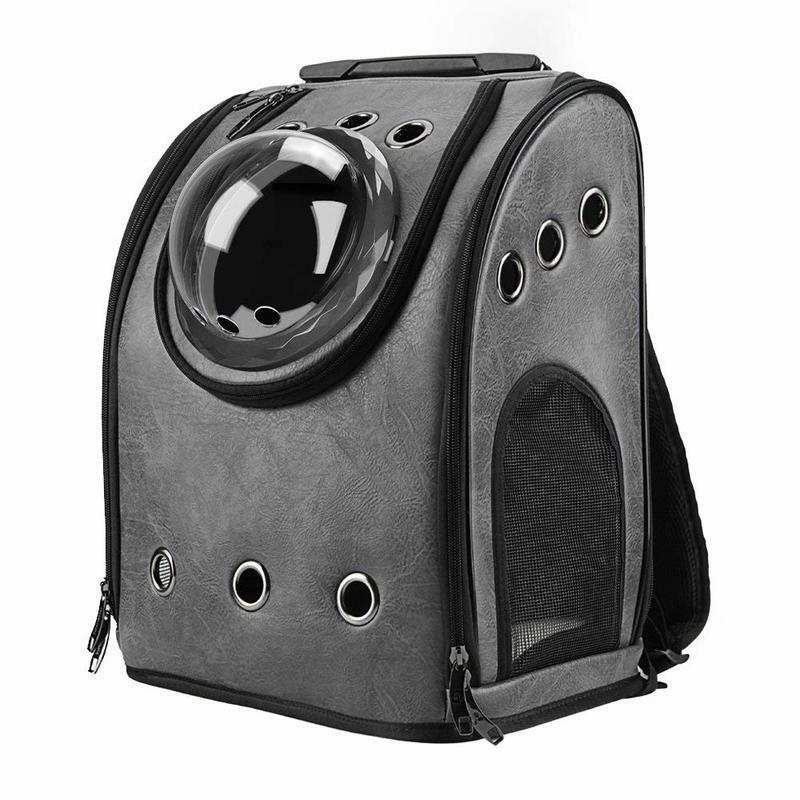 The Texsens Bubble Backpack Pet Carrier also features a built-in security leash that doubles as a punching ball for the cats, my little Flora uses it a loss as a toy when she is inside the bag. It has 9 one inch ventilation hole, two sets of three on each side plus one on the backpack face. 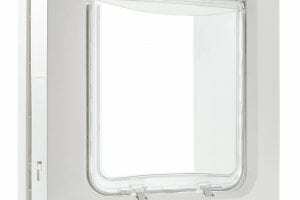 It also has two huge mesh so your kitty can look around on each side, plus a bubble window with a sphere looking port, which also comes with a detachable plastic mesh covering and another set of three ventilation holes on the plastic dome itself. 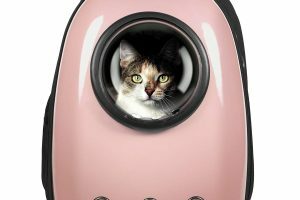 You’d be quick to know that your cats love the ventilation holes when you poke your finger or any toy in it while they are inside the Texsens Bubble Backpack Pet Carrier. Why cat’s and I have spent countless hours playing “catch the worm” on those ventilation holes. I would poke my finger at a random hole and try and tickle them or just entice them a bit, they would go crazy inside trying to catch your finger. Fair warning though, the cats can get around away though and would sometimes scratch too hard or try and bite your fingers, I still have all ten fingers – don’t worry, I just do not want any bloody surprises for you guys. Try and use the ventilation holes on the plastic bubble domes in the “catch the worm game” too if you can. Speaking of which, the dome and the detachable plastic mesh covering are interchangeable or can be used together, what I love to do especially when it is sunny outside is just the dome so that my babies can enjoy the view when I am biking around or when I am carrying them around while walking. So if you fear the idea that your cat or little puppy can suffocate or overheat inside the Texsens Bubble cat backpack and die, then that should be the least of your worries at this point. The back face of the Texsens cat backpack was surprisingly sturdy and had hard plastics as support pegs at the bottom. It is also well padded with an ergonomically designed inverted Y-pad to protect your hips and your spinal bones from bruising. Works well on those long bike rides, or when I want to bring my cats around on my scooter. I cannot say enough positive things about the Texsens Bubble Backpack Pet Carrier strap, it was surprisingly well padded and smooth and when you feel it for the first time, it lends a reassuring feeling that it is rugged enough to take the weight, soft enough to cushion your shoulders and yet, stylish enough to shine. The Texsens Bubble Backpack also features a carrying handle, just in case you want to bring your babies around luggage style, or if you want to set them down on the floor or on a counter-top. The zippers on the Texsens cat backpack are also huge and seems sturdy. I love the design because it removes the fear that your cat’s paws, tail or ears might be caught on the zippers because it is big and huge. 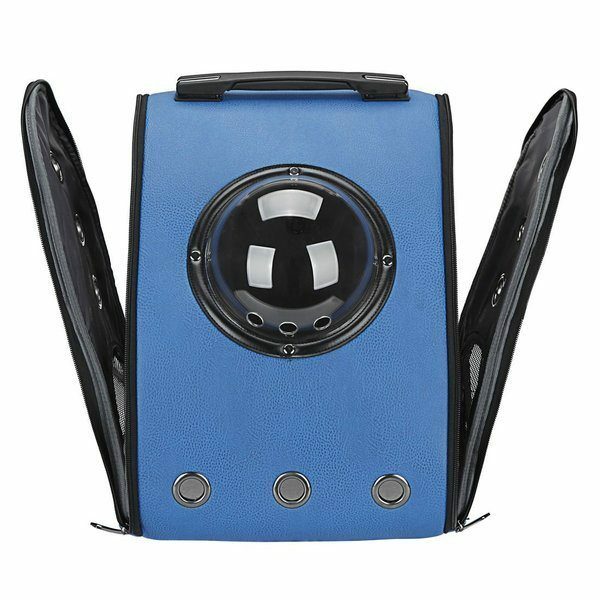 It comes with a reversible and removable pad that is machine washable, and the insides of the Texsens Bubble Backpack are fully abrasion resistant and scratch resistant. The Texsens Backpack also fit most major airlines backpack dimension restrictions, you can check on them individually in advance because they have different standards for backpacks. Warning #1. 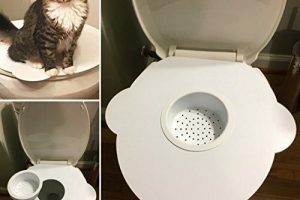 Your cats probably will hate it. Your cats will probably hate the bag if you push them to it, especially when you just got it off of the box. I have seen a lot of reviews and videos on Youtube about cat and dog owners struggling to push their feline and canine cuddles into the Texsens cat backpack. Well, of course, you are going to have a lot of problems when you do that, your furry four-legged family has far too sensitive noses and far too sensitive sensibilities to be pushed into an unfamiliar object, I doubt even you would love that experience. What I suggest is to air out the Texsens Backpack first when you take it out of the box to let the plastic and wrap smell dissipate. Then put it in a corner, open up the zippers, place familiar objects like toys and food inside and let them warm into the Texsens Bubble Backpack Pet Carriers. Remember it will be their temporary mobile home when they are with you and understandably, they do need to warm up to it and feel the Bubble Backpack before the can enjoy the experience. Do not, under any circumstance force them into it, let them transition over like what we do with new litter boxes. Warning #2. 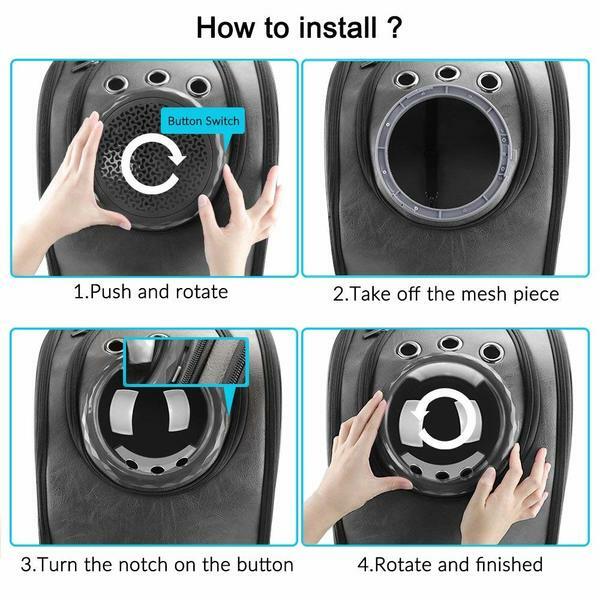 There is no instruction on how to install the dome, and as of now, I cannot find a Youtube video or anything on the internet that will help you out with this. Pro-tip before we begin the installation of the dome on the Texsens Bubble Backpack Cat Carrier, open up the bag first by unzipping all the zippers and flattening it on the table or on the ground. There are two rings on bubble backpack – the inner and outer ring – that will secure the bubble dome to the peephole, you can remove this by either pushing down or, if you can, hold the inner ring in place while twisting the outer ring to loosen it. Do it slowly, you don’t want to move the rings in the wrong direction. You will not damage the threads or the ring, but you will find that it can make you look silly for a good minute or two. When you removed the outer ring on the Texsens cat backpack, pop out the mesh (which comes installed) then placed the dome on the peephole aligning it with the guide canals. 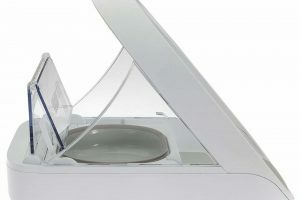 Place the outer ring on top of the dome, slide it in and secure into place, align the inner ring and turn to counter the inner and outer ring counter to each other to install it. Secure the rings, make sure that they are tightly screwed on and there you go. Ohhh… and make sure that you adjust the dome’s ventilation on the Texsens Bubble Backpack Cat Carrier and position it down before securing the rings in place, this will also make you look silly for a good minute or two if you place it right side up. Warning #3. You will become popular with Texsens cat backpack. I only have a handful of experience with the Texsens Bubble Backpack Pet Carrier where we were left in peace. It is quite a conversation piece, and if you have a beautiful fur family like mine, selfies, and pictures with theTexsens cat backpack, your pet and strangers would quickly become a norm. I don’t know, but the idea of a cat peeping through a hole looking like a catsronaut (cat + astronaut) seems to be a big hit with people from where we are, or anywhere that we’ve been through for that matter. Senior high school kids, senior citizens, off-duty cops, nurses coming home from the night shift, drunk vacationers at the beach, visiting groups on a tour… You name it, I think my cats, my Texsens Bubble Backpack Pet Carrier and I or my partner have taken pictures with them. So what is the final verdict on the Texsens Backpack for Cats? Not all pet carriers are made alike, especially the bubble backpack pet carriers. Texsens cat backpack stand head and shoulder above the competition in the casual carry category. 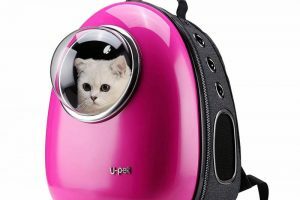 I mean, don’t think that just because this is my first time – as related in my story – for me to have a bubble backpack for pets, this is also the first time that I have used a pet carrier, far from it. So, if you think you need a Bubble Backpack for your furry family, then you probably do. And if you do need a Bubble Backpack, I would seriously ask that you consider the Texsens Bubble Backpack Pet Carrier. Like I said above, there are a lot of Bubble Backpacks in the market, some would even go for as little as 15$ to 20$ per pack, but would you really want to put your family in a cheap knockoff that just kinda looks like something that you need and not really the exact thing that you need? No, right? Like I said, the Texsens cat backpack is one of the best bang for your buck bubble backpack out there for your furry friends. 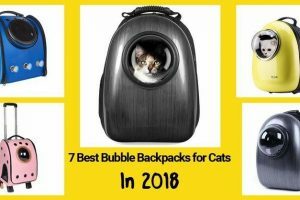 READ ALSO: 7 Best Cat Bubble Backpacks in 2018: Let’s Adventure!